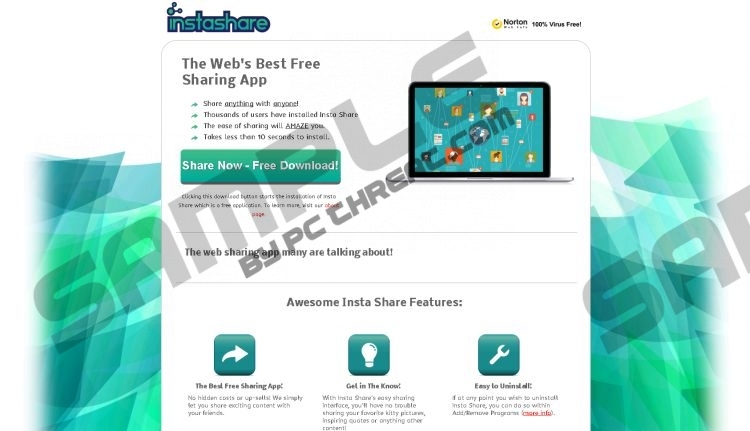 Insta Share is an undesirable application that might slither onto your computer without your permission or you might download it from its official website instashareonline.com. You should not mix this suspicious application with a legitimate program that has an identical name. It can be downloaded from instashareapp.com. Thus, if you have the latter version on your system, there is no need to remove it. However, if you have encountered the unreliable version, you should delete it as soon as possible because there is a possibility that it will show you commercial advertisements. Unfortunately, it seems that they will appear on Internet Explorer, Google Chrome, and Mozilla Firefox browsers, which means that you will not be able to browse the web without any interruptions. In order to find out the easiest method to remove Insta Share, you should definitely continue reading this article. The specialists of pcthreat.com have found out that Insta Share is based on the same engine as such undesirable programs like Websteroids, Blasteroids, Disasteroids, Zombie Alert, and Share Anything. Thus, it is not surprising that it tends to travel bundled with different kinds of suspicious applications as well. As you can see, even though Insta Share is promoted on its official website instashareonline.com, it might still slither onto your computer without your permission. Thus, it is not even surprising if you cannot remember downloading this program. Many computer users download Insta Share themselves because it promises to make the sharing process easier. Unfortunately, the program is not as beneficial as it might seem at first. As the specialists of pcthreat.com have revealed, Insta Share has many drawbacks. Firstly, it will display commercial ads on your screen; secondly, it might collect information about your activities on the web, and finally, it might connect to the internet without your permission in order to send the collected data to third-party advertisers. If any of these activities seem unacceptable to you, you should erase Insta Share without any further considerations. Insta Share is not as beneficial as it claims to be; thus, there is no point in keeping it on the system. In order to eliminate this program easily and quickly, you should definitely leave all the work for an antimalware tool. Do not forget to keep it enabled in the future as well. It is very important if you want to keep your computer safe. Select it and then go to Uninstall a program. Find the application that you wish to erase. Quick & tested solution for Insta Share removal.